Hello and welcome to the 672nd installment of the SWD. Syrian Democratic Forces’ Manbij Military Council arrested seven individuals in Manbij city, on charges of cooperating with Turkey and the Turkey-backed Free Syrian Army. Seven more battalions operating in western Aleppo and Idlib governorate released statements announcing that they are joining Faylaq al-Sham. The battalions that joined Faylaq al-Sham are; Katibat Ahrar Maarat al-Artiq, Katibat Shuhada Khan al-Assal, Katibat Ahrar Halab, Katibat Ahrar Khan al-Assal, Katibat Shuhada Taramanin, Katibat Ahrar al-Dana, and Katibat Sayf Allah. 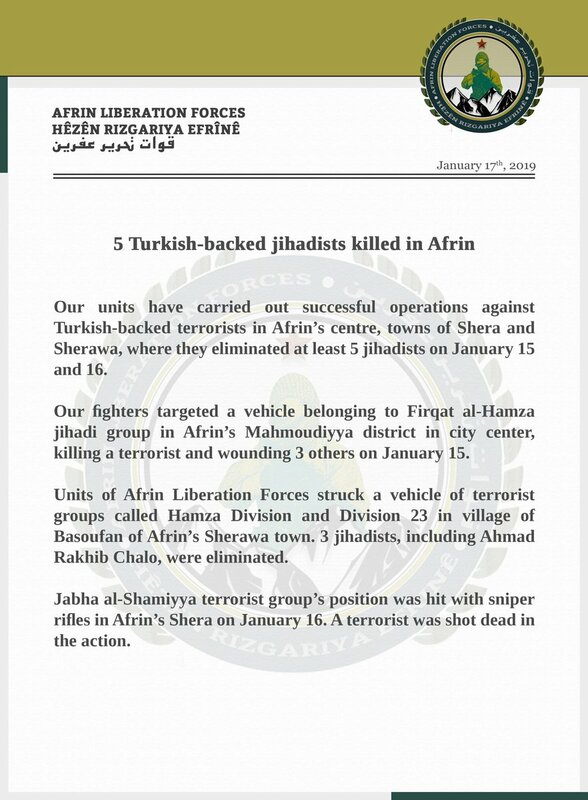 ‘Afrin Liberation Forces’ (Hêzên Rizgariya Efrînê) released a new statement claiming that at least five elements of the Turkey-backed Free Syrian Army were killed in Afrin region. Left over Islamic State’s improvised explosive device wounded a civilian in Al-Haramiyah neighborhood of Raqqa city. Unknown gunmen killed one and wounded one element of Hayat Tahrir al-Sham on a road north of the city of Khan Sheikhoun. Separately, unknown gunmen attempted to assassinate a Faylaq al-Sham’s commander, Muhammad al-Bashi with an improvised explosive device planted under his vehicle in the city of Salqin. 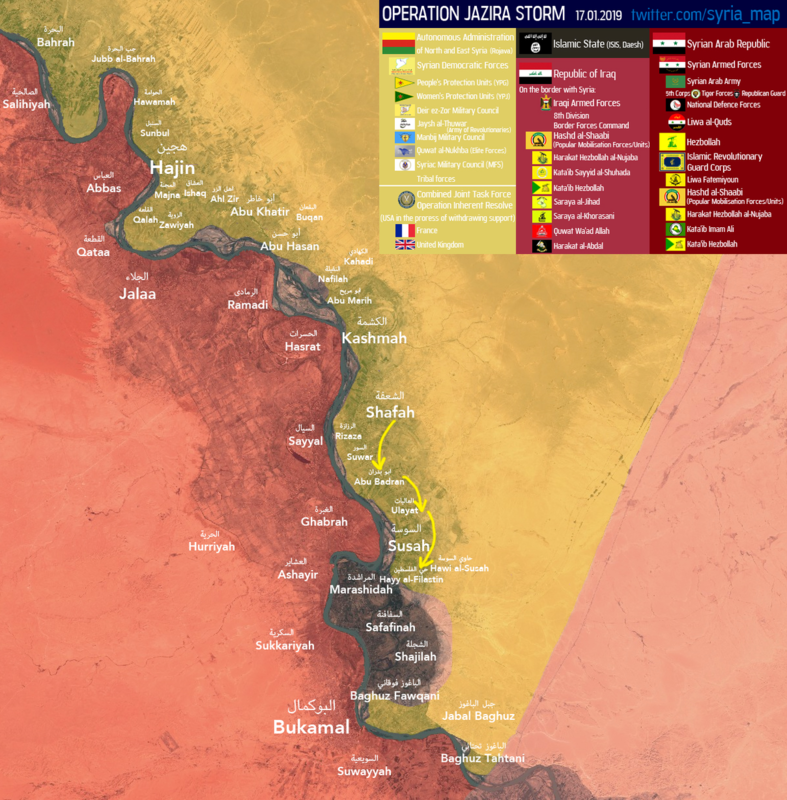 Guerilla group calling itself “Al-Muqawama al-Shabiya” (Popular Resistance) wounded the director of Nawa area, Nidal Qouuja Ali as he was travelling in his car. Islamic Emirate of Afghanistan’s (Taliban) improvised explosive device destroyed an Afghan National Army’s armored personnel carrier, reportedly killing and wounding nine soldiers in Yangi Qala area of Khwaja Sahib Posh district. Islamic Emirate of Afghanistan ambushed an Afghan National Security Forces’ convoy and forced it to retreat from Murcha Khelo, Paya Khelo and Dara Miya Sahib areas of Alishang district. Six elements of the Afghan National Security Forces were reportedly killed and three wounded in the ambush. Afghan National Security Forces killed nine elements of the Islamic State, including three local commanders in Achin district. Islamic Emirate of Afghanistan’s snipers killed three and wounded three elements of the Afghan Local Police in Khanjar area of Hisarak district. Afghan National Security Forces reportedly killed 39 and wounded 28 elements of the Islamic Emirate of Afghanistan, as well as destroyed 20 motorcycles and cleared five villages in Ab Kamari district, according to the Afghan Ministry of Defense. Afghan National Security Forces killed 11 elements of the Islamic Emirate of Afghanistan in Ghazni district.